The right hand side of De Keyserlei is of lesser interest, unless you’re hungry. In the streets behind the movie halls, there’s a truly amazing selection of ethnic restaurants, a bit from all over the globe. Some of them indeed very good, others… more basic. There’s also a Russian shop, Matrjoshka, where sometimes beers from Lithuania, Georgia or Armenia have been found, as well as the classical Baltika’s from St. Petersburg. But we go on, until, at the end of Keyserlei, we cross the “Leien“, actually a ringway avant-la-lettre. Underneath, there’s a metrostation, and it might be interesting to cross underground, only to come up via the escalator at Leysstraat (more a square in reality, than a street) and have a literally mounting look at the buildings on both corners of Leysstraat, showing best how Antwerpen must have looked at the turn of the 19th century, as they are more or less contemporary with the station, and everything in between was then plain field. They look great, IMO, even if it can be called kitsch. You go straight on, walking on a pedestrian road to a round point, where Antoon van Dijck (in England “sir Anthony van Dyck“) is on a huge pedestal. You go on, following the main Antwerpener shopping street, called Meir. It makes a gentle curve, with in the “armpit” of the curve the former city exhibit hall, now a grandiose shopping mall. Well, grandiose, opinions are divided, but I must confess to take to it. The second opening on your left, is called Wapper. This street is rather broad, with a fountain and greenery behind. You turn into Wapper, and halfway, on your left, is the Rubenshuis. IMO, if you visit nothing else, visit this. It is the former house and workshop of the famous baroque painter Pieter Pauwel Rubens, and nothing compares to it, to get an impression from Antwerpens’ Golden Age, the 17th century. Unless you’re there on Monday, because the only thing of interest opened on Mondays in Antwerpen are pubs. Rest is shut. Horta designed this as the Volkshuis for Brussels. Brussels destroyed it, but parts were recovered by a consortium, aided by Palm, and now enrich this superb place, showcase of Art Nouveau. But I first wanted to point you to Oud Arsenaal, as, if you have to look at Horta’s piece, you cannot avoid to look at the Theater building behind it. “Designed” (if that word could be used…) in the sixties-seventies, this must rank amongst Europe’s most insanely ugly buildings. Less important, but good to know, if you would follow your steps from Oud Arsenaal onwards, a couple of decametres to the right is a small square. At the end of the square, the old opera – a jewel… for contrast. Oh, and on the right side of this square are a couple of restaurants and one special pub: De Duifkens (the Pigeons), where you’ll find the beau-monde of artists, actors, operasingers from Antwerpen… And the “bollekens” De Koninck on draught are always top. The square behind the horrible theatre, left, houses on Saturday the “strangers- market”: the best place to buy fresh coriander, hot Vietnamese springrolls, handmade pasta, halal mutton or olives on 100 different ways. Only Saturday, unfortunately. So, we’ve had our drink @Pijpelincksstraat/Graanmarkt, and we retrace our steps to the Rubenshuis, and further until we reach Meir again. I suggest you halt for a moment, and contemplate the building on your left hand side. The building itself is right on the corner from Meir (where the entrance is), behind (on Wapper), there’s a garden and finally a backpart. The main building is the former royal residence. Inside, not much is left, but the building itself is a nice classical building. 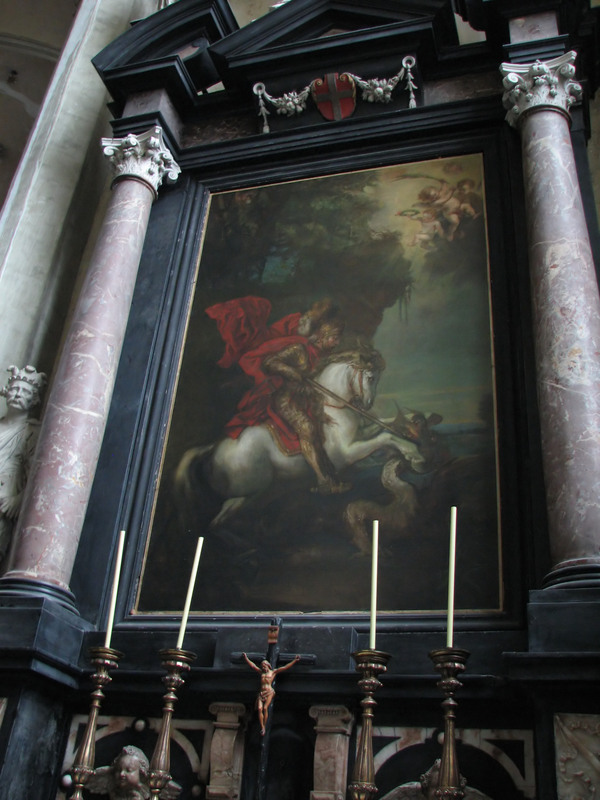 The former Be king (Baudouin) left it to the town of Antwerpen, but the probable next king took the furniture with him. Since thinking is not his forte, I wouldn’t be surprised he thought it normal – but that’s only my opinion. Turn to your right and diagonally across Meir, there’s a small street. The cornerhouse is in the same style as the royal residence, but even nicer. 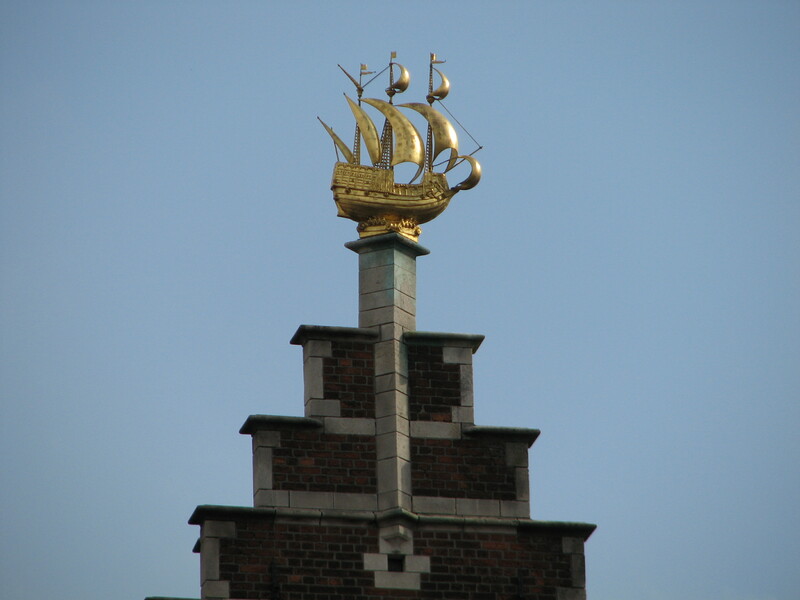 This is called Osterrieth-house, and was a project from the former director of the bank “van Parijs en de Nederlanden“, now a part of the BNP group. He furbished it with art and extraordinary paintings; including two originals by Rubens. Where they are now, is anybody’s guess. The little street just in front of it, Eikenstraat, is the one you need. You go to its end, and arrive this way on the side entrance of the St. Jacobschurch This is the first one of the five main historic churches. It is pure gothic, and hence, it never was ended as intended. It ought to have become the largest gothic church in the world, but by the time the money ran out, Renaissance had come and gone, and other churches were already Baroque! It is still a beautiful building, anyway, and it contains the tomb of Rubens, some painting by him, and it’s a heaven of peace. You have to exit the church via the same way, and then turn right, and right again, so you’re in St. Jacobsstraat. This one ends perpendicular on St. Jacobsmarkt. 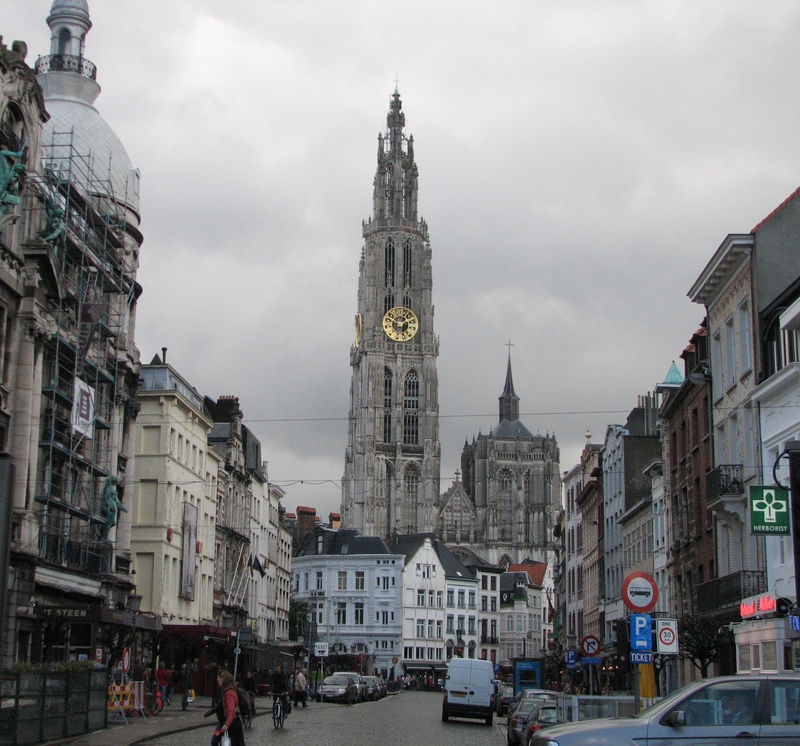 The pub on the corner, under the church and with the same name, is one of Antwerpens’ oldest. In fact, when the megalomanic St. Jacobschurch was started, the town ended just to the other side, and the pub had already that name, probably because here started the pilgrimagetrack to Santiago (= St. Jacob) de Compostela in Mediaeval times. The pub, owned by De Koninck, was totally rebuild in the eighties. Stephen D’Arcy, main British critic on all things Belgian, loved it, and made it an example for British architects. I’m less over the moon, seen that they put the new bar in the length of the building, instead of perpendicular, which is the way the pub has been conceived. Oh well. If you haven’t had a “bolleke” by now, this might be the moment. Otherwise, you cross St. Jacobsmarkt, and follow through Prinsesstraat. Pass one small street on your right (take a peek, couple of blocks away is a beautiful tower and building, which, until the day of now, I haven’t been able to penetrate. Which makes it all the more tantalizing). Go on to the next corner, where you’ll find “The Highlander“. You’ve guessed it, Antwerpens’ Scottish pub. Great choice of malts, some good beers, very good atmosphere. When it is too crowded ground floor, the cellar (a former butchers’) opens. An idea here might be “Zeppelin“, brewed expressly for this bar. But it was better once, change of brewer willing. The buildings are very old, and if you happen to chance upon one of the two owners (not: landlord), Pieter and Hans Bombeke, ask for a tour, with my compliments. Once you’ve risked enough, go onto Stadswaag again, and follow the same direction you had been taking before (meaning: turn left, left again), and you’re in Mutsaartstraat. This one ends on a kind of square, formed by a couple of streets meeting. On your left hand side, there’s a garden. If weather is nice, and schools are on, maybe hop in through the portal, and find out that the Antwerpener Academy has a true little arboretum: most trees are specially searched. Retrace your steps outside, cross the square in still the same direction (Ambtmanstraat), which ends in a T on Keizerstraat. 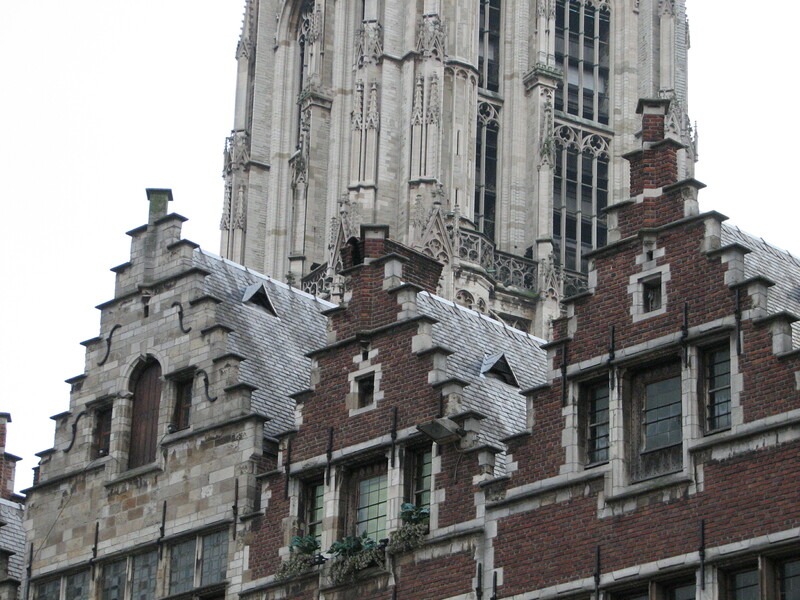 Probably no street in Antwerpen has so many beautifully preserved, and yet unknown buildings. The absolute top is just in front of your eyes, left hand: the Rockockxhuis. Today a private museum (well worth visiting), it used to be the house of a friend of…. Rubens, but also former Lord Mayor of Antwerpen. Go left, cross, right – in 10 metres. Oh yes, by this time you know better than to think Antwerpen has no small cobblestone roads… On corner of Moriaanstraat and Leeuw van Vlaanderenstraat, there’s “the” Quinten Matsys”, Antwerpens’ oldest pub, staunch property of De Koninck. 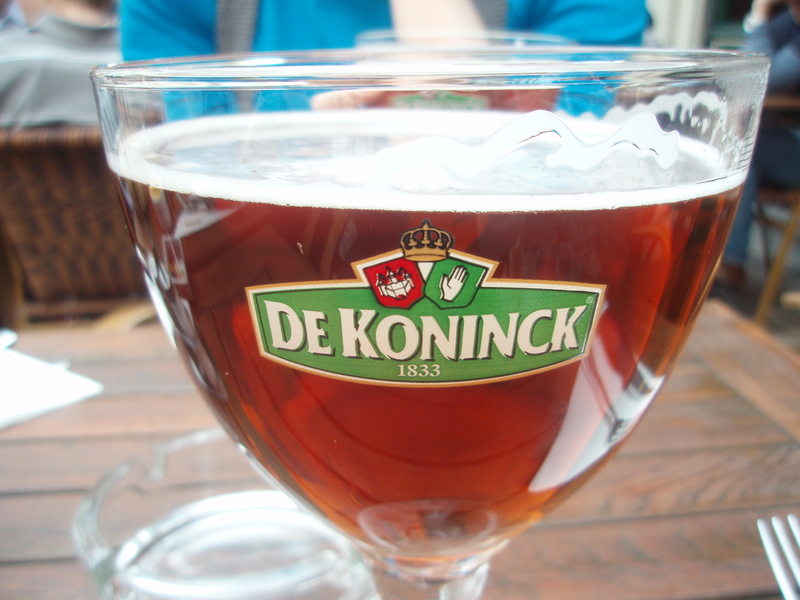 Here you might choose a De Koninck beer on draught, that is NOT an amber “bolleke” – maybe a Tripel, a Blonde, a Winterkoninkske… Whatever, avoid the fruity summerconcoctions! Next corner (up) used to be a very basic pub, with a superb counter and bar, and very friendly to strangers – but I fear this one has gone to the big sky for pubs… If it’s still there… again a bolleke, I’m afraid. Cross Wolstraat onto yet another pedestrian street, Coppernolstraat, and follow it until you reach Minderbroedersrui again. Now you follow this in opposite direction, going straight on to the stream. Minderbroedersrui changes into St. Paulusstraat, indicating we’re nearing yet another of the big churches; it’s at the end, near a… YES! GUESSED! square, but the entrance is before that, on your left hand. Magnificent entrance, with a Calvary. St. Pauluschurch is, with St. Andries, the least well-known of the five major churches, and therefore, usually very quiet. Go out again, and now – decisions, decisions. Either you turn back into St. Paulusstraat, retracing your steps. In fact, if this is late hour, I vividly recommend aborting your mission, and turn onto the St. Paulusplein (the square), and head for the very town centre and bars. Or, turn back into St. Paulusstraat, until the next corner, and turn left or right (get yourself a map, now). But if it’s broad daylight, and you’re adventurous… go out the church left, and turn right into Oudemanssstraat, then right Leguit. Best take your wife with you, because you’ve just entered the seediest red lights district you’ll ever witness. Knocking means not just friendly invitation, but paying dearly… I haven’t tried, so far. Leguit broadens and leads onto Falconplein. A couple of decennia ago, this was Russian maffiaterritory, but it has calmed (died?) down seriously. Turn left on Falcon, and, at the lights, cross Brouwersvliet, and turn right into Giststraat (yeaststreet…). In front of you dooms up a beautiful pub, but the main interest is immediately on your left at Adriaan Brouwersstraat (no – that guy was a painter…), were the Brouwershuis is. Don’t take the meaning wrong: rather than a guildhouse, this featured a pumping mechanism (horsepower), for getting clean water for brewing from the north of Antwerpen into the town, in the 17th century – an imaginative tour-de-force from a project developer avant-la-lettre, Gilbert van Schoonhoven. He had no official status, but virtually owned the town, lord mayor included… Even in those times! Brouwershuis, however, is a sadly neglected building, in dire need of repair. There’s group of people, beerlovers included, that are trying to save it – maybe give a ring, and tell them tourists would love to visit (if somebody pointed it out to them). Now you have to make a decision – do you want to see everything, or are you getting tired? « Un Campione… non per caso!